Heat water in pot over medium heat. When water simmers, add noodles. Stir occasionally or follow directions on noodle package. Run cold water over noodles for 5 seconds. Drain remaining water and put noodles into serving bowls. Pour broth and water into a pot. If available, put star anise into pot. Heat soup until it simmers. Put in noodles and immediately remove noodles to serving bowls. Add chicken to serving bowls. Bring soup back to simmer then pour into serving bowls. Sprinkle green onions over serving bowls. Enjoy. 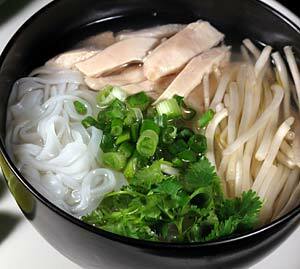 If available, add to soup chopped cilantro, bean sprouts, and lemon juice.